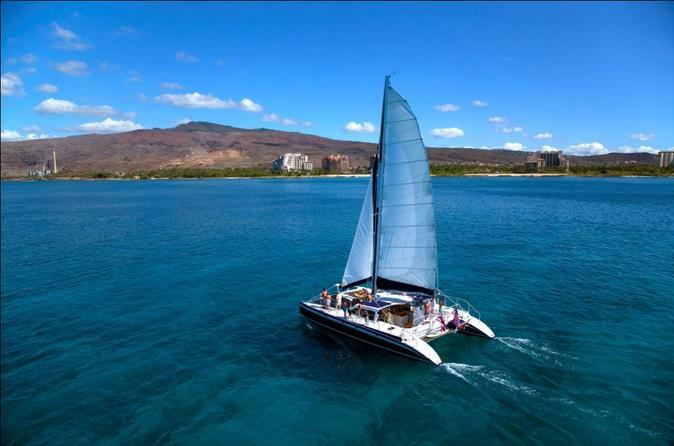 Enjoy a 3.5-hour sailing cruise on a gorgeous, 53' foot catamaran from the beautiful Ko Olina Marina on Oahu. Snorkel among millions of fish at 2 different tropical reefs while you scan for dolphins and listen for whales. Eat a delicious, Hawaiian-style lunch with complimentary cocktails as you soak in the sun and relax by the water. Includes complimentary transportation to and from select Waikiki hotels. This incredible sailing and snorkeling experience starts with a your choice of morning or afternoon pick-ups from your select Waikiki Hotel and a short ride to the Ko Olina Marina and Resort. From the dock, you will check in and help yourself hot cocoa and tea as you meet your captain and board the boat. The 53' foot sailing catamaran you will spend the next three and a half hours on comes with fresh showers, a gorgeous teak interior, and comfortably fits up to 40 people with plenty of space for lounging around and spreading out. The boat includes a fully-stocked bar for cocktails and complimentary beer, wine, cocktails and non-alcoholic drinks will be provided throughout the day. From the Ko Olina Marina, your captain will take you to your first stop of the day - a beautiful reef where more than 200 spinner dolphins are regularly known to feed and play throughout the year. Grab a mask and jump in the water - your trip includes all the snorkel gear required to explore the reef and document the exotic marine life that call the place their home. You can also choose an option SNUBA upgrade, a novel snorkeling technique where an oxygen tank floats on a raft above you and air is pumped into a mask allowing you the freedom to stay underwater longer without needing actual scuba equipment to explore the reef. After your second reef visit of the day, a Hawaiian-style lunch of pulled pork sandwiches, chicken teriyaki, and soy-veggie burger (upon request) will be served along with 3 complimentary cocktails for those over 21 years of age. Feel free to relax on the deck and enjoy the amazing Hawaiian weather as you head back to shore for a shuttle ride back to Waikiki or the parking lot to pick up your car and head to your next adventure.